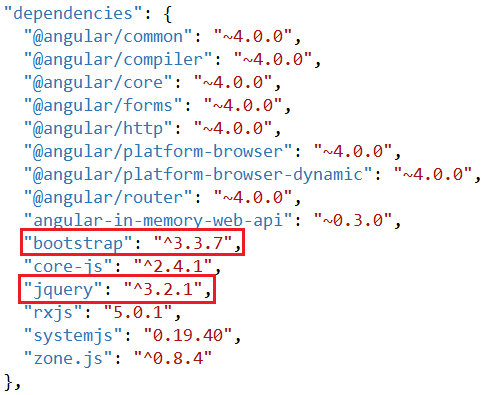 How to install and use Bootstrap with Angular : There are several ways to install Bootstrap. One way is by using Node.js command prompt. 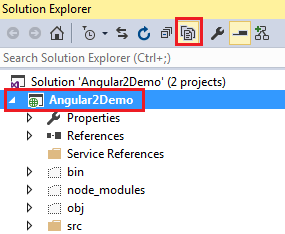 Step 2 : In the command prompt navigate to the folder that contains your angular project and type the following command and press enter key. As Bootstrap has a dependency on jQuery, we are installing jQuery as well. This installs both Bootstrap and jQuery for use with our Angular project. Notice from the screenshot below, Bootstrap version 3.3.7 and jQuery version 3.2.1 are installed. The required Bootstrap and jQuery files are copied into the node_modules folder within the project directory. Step 3 : Finally in index.html file add the following script and link elements to reference the required CSS and JS files. As you can see, these files are being served from the node_modules folder. The problem at the moment is intellisense for Bootstrap CSS classes is not working in index.html, or any of the components html or stylesheet files. 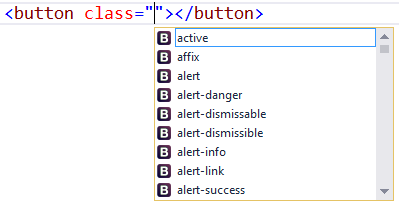 How to enable intellisense for bootstrap in Visual Studio : Use the following workaround to enable intellisense for bootstrap in Visual Studio. 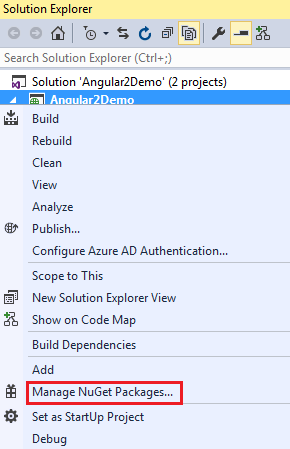 Step 1 : In Visual Studio, click to select the Angular project and then click on "Show All Files" icon. You will then see "node_modules" folder. Step 2 : Expand "node_modules" folder. 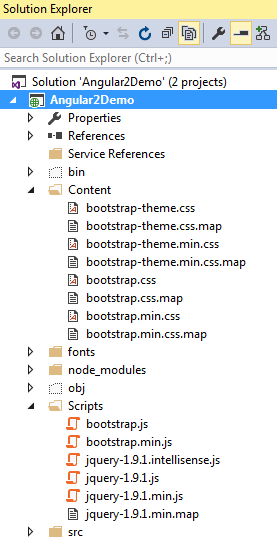 Locate "bootstrap" folder. Right click on it and select "Include In Project" option from the context menu. At this point you should get bootstrap intellisense in index.html and all angular component html files. If you still do not get bootstrap intellisense, please restart Visual Stduio and you will get intellisense. As I said before, there are several ways to install bootstrap. One way is by using Node.js command prompt. The other way is by using Visual Stduio NuGet package manager. To install Bootstrap using NuGet package manager follow these steps. The required CSS and JS files are placed in Content and Script folders. Finally place the required CSS and JS files in index.html page to start using Bootstrap. 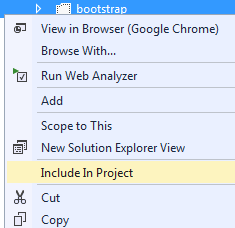 If you install Bootstrap using NuGet you don't have to do anything else to get bootstrap intellisense. If you do not want to download bootstrap, you can use their CDN links. You can find the official Bootstrap CDN links at the following page. Besides these 3 ways, there are other ways of installing Bootstrap. Which way to use depends on your project needs. Thank you sir, Great article! Your angular 2 is amazing﻿. what could be the reason. I am using vs code.